Keep them warm in these cozy fleece one-piece PJs. Ready for bed in one easy zip! Cute green dinosaur allover print. Soft, cozy fleece fabric. 100% polyester. 69.5-87 lb. NOTE: Left sleeve has a small hole (see pic). Blue tee with inset thermal knit white long sleeves. Size 7 (48" - 50.5" Height, 49 - 55 lbs. ). Flambant neuf - pas de défauts ! nous avons une maison sans fumée. Taille 12 ans. Color Ivory. Material 100% Cotton. Style Pullover. Black and gray striped rugby long sleeve shirt. Red embroidered bear. Collared shirt. Size 5. Tees are in over all good condition. Blue tee is a good play tee, has marks on front of tee refer to photo. Both have a little wash fade. 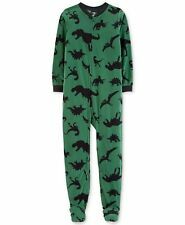 BOYS 24 MONTH BLUE LIZZARD & BUGS SUPER COZY FLEECE SLEEPER. ~ CHILD OF MINE. 100% POLYESTER. I will try to work with you to resolve any problems. ~ ~ ~ ~ ~ ~ ~ ~ ~ ~ ~ ~ ~ ~ ~ ~ ~ ~ ~ ~ ~ ~ ~ ~ ~ ~ ~ ~ ~ ~ ~ ~ ~ ~ ~ ~. Like New....Carters Boy Shorts, Navy 4T. Condition is Pre-owned. Shipped with USPS First Class Package. The collar will help keep the child's neck warm when zipped up all the way. It has a fleece like look but is 100% polyester. Machine wash cold with like colors. Tumble dry low. Do not iron. Good used condition. Will combine shipping. Carters Boys Shirt. Size 8. Fits tru to size. Excellent condition! Soft cotton( denim imitation). Please, check my other items-combine shipping available! It comes from smoke free and pet free home! Thank you for looking and happy bidding! LONG SLEEVE, BRICK RED, SOFT, FOOTBALL AND READS "FUTURE NUMBER ONE DRAFT PICK" ON THE FRONT. MADE FROM 100% COTTON. m 1 ( 2347. Great, Just as described. f 1 ( 40. Beautiful Item! Very Fast! ). Machine wash cold. Wash with like colors. 100% polyester. Color: Blue. Tumble dry low.